I sat on the floor of my room, curled like an apostrophe around a bookcase lying prone on the infuriatingly un-level carpet. Holding the side of the bookcase against my knees, I clamped the shelf under my arm and twisted the screwdriver painfully with my right hand (I’m left-handed, so this took a fair bit of coordination). It was nearing dinnertime, and I had a meeting to go to, but I was absolutely determined to get this thing put together. Before I had to go anywhere, before I ate, before the Engineer came back from whatever he’d been doing all day, this bookcase would be upright and my books would be rescued from their homelessness. This corner of my room had been driving me crazy for weeks. My printer was perched precariously on a wobbly table with spindly legs. My books were stacked as neatly as possibly in various corners of my room. My papers were strewn in heaps under the printer and on the ledge running under my window. Clearly, I needed a bookshelf. What I had envisioned was a bookcase already assembled, perhaps one from a garage sale or a family member’s guest room, or even Goodwill. Nothing fancy, of course, but already possessing nails and screws in all the vital places. I found myself instead with this pressboard, “coffee cherry” finish kit from Shopko and a familiar stubborn voice in my head telling me I didn’t need anyone else to help me put it together. And I was right. I may have attached the bottom slightly crooked and had to redo it. I may have had red lines that purpled into bruises on my legs from holding the pieces tightly together while I twisted the screws through. I may have nailed the cardboard backing on so that it bubbles out a little bit at the bottom. 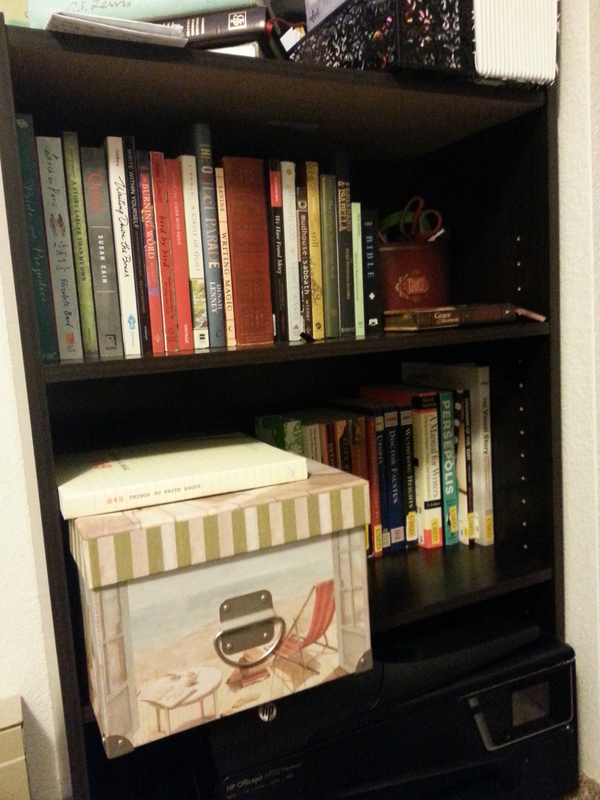 But it stands, and it holds my books, and I am happy. My mother (who, as you may recall, also likes to rearrange furniture at times) put together the table and chairs in our breakfast nook at home all by herself. She wrestled with the legs and heavy top, chased screws across the floor out of the cat’s reach, and threw a tablecloth over the finished product with a proud flourish. I suspect I get some of my independence from her. I’ve been fortunate enough to always have people to call if I need something moved, or built, or fixed. But it’s nice to know that, should the need arise, my bright pink toolbox and I can probably figure things out. College, Life in General, TransitionsFeminism, Life At School, Who let me adult? Fathers of daughters are determined to ensure that their little girls can be self-sufficient and not have to depend on untrustworthy boys with scandalous designs on their daughters for assistance. So during our many cross country road trips during my Marine service I would lecture..I mean explain….to them about various subjects like basic electricity, plumbing, and most importantly, the operation of the internal combustion engine and its collateral parts. If they were on the road and a problem happened with the car I didn’t want them to be at the mercy of Conway McConman, the shade tree mechanic at the local mechanic’s shop. For my efforts I reaped unending calumny, scorn, and mocking dismissal of my fatherly advice. Occasionally the subject will arise even now and when it does the assaults upon my character renew afresh. As an addendum, independence is only one of the wonderful qualities you get from your mother who is one of my favorite people in the world. I’m sure my dad would agree with your viewpoints, and there must have been several lectures I’m forgetting on things like car maintenance and being assertive with the people at the phone store who will try to rip you off. My beloved mother, however, had more opportunity to demonstrate these independent qualities since our dad was on trips so often. My youngest got fished in to a “Free” deal when AOL was sending out CDs to everyone with a heartbeat. She decided that it was lame and cancelled but, of course, the cancellation got “lost” and the next thing she knew her bank account was overdrawn because AOL had made the charge. I found the insufficient fund notice by happenstance and asked her what was going on only to find that she had called AOL and given them what for and got the cancellation processed effective the day she made it, and called the bank and demanded that the overdraft notice and charge be revoked because it was the scoundrels at AOL who were at fault and the bank did as she asked. I asked her “Why didn’t you tell me” and she said “Why would I? I could handle it.” I knew she was going to be just fine and so she has. Confident daughters make dad’s very happy.